It’s Summer Time and NSSA is at the peak of its season. Mokulele Airlines is proud of our athletes representing us in California. Summer Macedo, Ocean Macedo, Cody Young, Cole Alves, Luke Heflin, Ocean Donaldson, Kala Willard, Brodi Sale, and others shined brightly. Mokulele Airlines had a very solid roster of athletes, each of which was ready to compete and brought their A+ GAME! Our most exciting performance this season comes from Summer Macedo! She is a 16-year-old phenom from Lahaina, Maui. Summer is one of the original members of the program and has grown into mentoring the other team riders. Summer and her brother Ocean Macedo both joined the team in 2013. Both siblings have earned National titles. Summer in particular has excelled to the pinnacle of competitive surfing by winning a ISA Junior world title at age 15. She has recently been working with a variety of trainers and coaches to continue improving in every aspect of her game, as she approaches the transition from a Junior Pro into the Women’s Pro Qualifying series full time next year. Also known as the “Women’s QS”. Summer recently participated in the Women’s QS 6000 and the Junior Pro in Cabo San Lucas, Mexico. She placed a respectable 9th in the Women’s QS side of the event. But it was in the Junior Pro, among some of the best Juniors in the world, where Summer broke through to capture the win after finishing runner-up last year in the same event. Now back in California for Surfing America Championships and NSSA Nationals, Summer just won the Surfing America Championships Girls U18 National title at Lower Trestles. As a result of these current wins she was the recipient of this years prestigious Governor’s Cup, which is the the highest Amateur National trophy in the U.S. for Girls and Boys Under 18. Summer is competing in a few more Women’s QS 6000 (highest rated World Surf League qualifying events) for the remainder of 2017, but her main goal is to qualify for the World Surf League Junior World Championships held in Australia early next year. Her last chance to qualify, will be at the Turtle Bay Junior Pro, on Oahu, in October. The team at Mokulele is extremely proud of both Summer and her younger brother, Ocean, as well as all the other team members as they continue to grow and succeed in their sport. 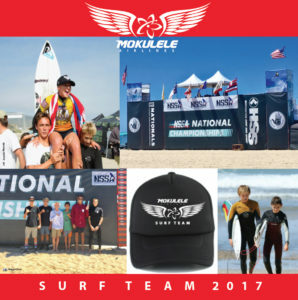 With summer just under way our Mokulele Surf Team is already generating momentum to place at the top in every age division. Boys and Girls alike, our team continues to shine in the heat of competition wherever they enter into an event series. Best of luck to all the competitors as the rest of your summer events unfold. Please be sure to provide the Mokulele marketing team ( [email protected] ) with photos and content for Social Media as the event take place.